classes and just space rentals & planning for a fun shindig. + Just about any party you can think of, we can help make happen! Treasure Island Music Festival, Dreamforce, Salesforce, Levis, Target, Uber, American Eagle, Charlotte Russe, The Gap, Anthropologie and many more. Our venue is two floors and comfortably handles up to 40 for private workshops, classes, formal sitting events and up to 120 for larger more party style events. There are several larger venues we partner with including the WBU and Ace Hotel. We do offer smaller weddings that are more casual on site. 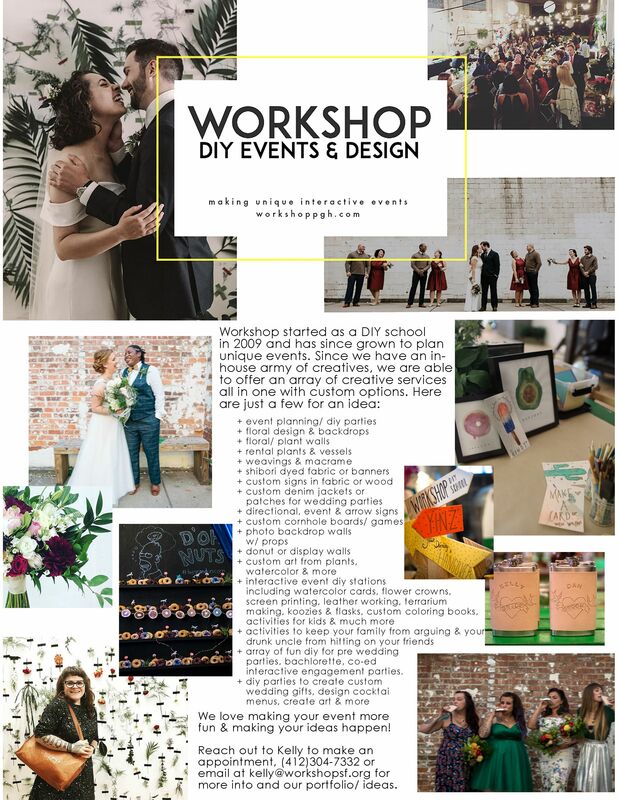 We also are experts at event planning, create custom decor, DIY for pre wedding parties and even do DIY at weddings to make them more interactive (think live screenprinting of favors, flower crown stations and more). We also create custom wedding decor & design, click here for information. For more ideas and photos please see our pinterest. For a menu and ideas- contact Kelly@workshopsf.org for more information.